Head Writer: OK, people: vampires are played out. Give me a fresh new twist on them, something like that flick David Bowie was in. Head Writer: Shut the hell up, college boy. You're WORSE than a monster. (LIGHTBULB!) That's it! This one came out in the mid-90s, during the peak of a few different cultural waves. Independent films were having a big boom, and heroin was busily laying waste to a generation of artists. Trainspotting would come out about a year later to mark the intersection of these two trends. Have you watched that movie lately? It holds up, but it's definitely a time capsule. The Addiction also uses heroin as a metaphor, and is also a time capsule, for both good and bad. Lili Taylor plays Kathleen Conklin, a philosophy grad student at NYU. As she walks home from class one night, she's pushed into a dark alley by a beautiful woman who bites her and drinks her blood, turning her into a vampire. As Conklin experiences the change into vampirism, she becomes more cold and detached, using her philosophical education to justify her growing addiction to blood. She becomes reckless, but also meets a much older vampire, Peina, who is played by Christopher Walken (who is still one of the most awesome actors in Hollywood, but was everywhere in the 90s). He's like a vampire Bill W, teaching Conklin to control her addiction, to feed on only a little bit, and only when she needs it. She rejects his teaching, however, and at a reception to celebrate the completion of her doctorate, she and the other people who she has vamped have an all-you-can-eat blood buffet at the expense of the other party guests. Most horror films would have ended there, but this is a mid-90s addiction film, so it needs a glimmer of hope at the end (see also Trainspotting, Permanent Midnight, The Basketball Diaries, etc.). Conklin tries to kill herself with sunlight, but is stopped by another vampire. She visits a priest and receives absolution, and the last scene shows her walking in sunlight, away from her own tombstone. I liked this movie. It's not perfect, but it's good. Ever since Say Anything, I've always really liked Lili Taylor, and thought she should be a bigger star. (I honestly can't remember a single one of Ione Skye's lines from that movie, but I remember every word to Taylor's songs. "That'll never be me, that'll never be me! That'll never be, never be me! NO... NO, NEVER, NEVER, EVER. And don't you EVER THINK IT!") Parker Posey was the 90s indie film girl who I wanted to hook up with, but Lili Taylor was the one who I wanted to go drinking with. That said, the weakest points in the movie were the ones where you're watching Conklin unbelievably writhing on the street from withdrawals, or spouting some pseudo-philosphical blah blah. There's a couple of different metaphors at work, too. 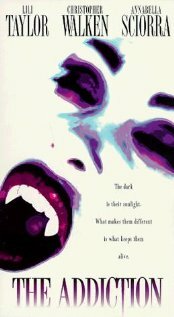 There's the very obvious addiction one, but there's also an interesting lens on the psychology of abuse, as all of the vampires first tell their victims that the victim will be spared if they act forcefully enough, and later find reasons to blame the victims for the abuse they received. In the movie's last shot, Conklin's tombstone shows her birthdate to be Halloween and her date of death to be All Saints Day. The scripture inscribed is John 11:25 ("I AM the resurrection and the life."). That's a lot to put into one very quick shot. It's not very scary, but it's a good shot of 90s indie film flashback nostalgia. I give it four vampire Walkens out of five. Joe lies. . . Joe lies. . . when he cries. . . .
i think your sentimentality is only encouraging this film. i'd say enabling, but i do not know what that word means. I can't tell if that means you like it or don't like it.